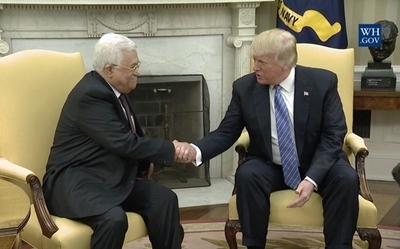 Palestinians cannot expect to see a lasting peace until their "leaders speak in a unified voice against incitement to ... violence and hate," President Donald Trump told Palestinian Authority President Mahmoud Abbas during a White House meeting Wednesday. The president also raised concerns over the PA's program of paying terrorists and their families. Abbas is unlikely to end the program, with a top aide calling the idea "insane." Amid growing pressure to halt this practice, it is important to note that Abbas is directly behind the policy surrounding terrorist transfers. By amending the Palestinian Prisoners Law in 2010, Abbas increased monthly installments from approximately $275-$1110 to $390-$3320 per month, reports Palestinian Media Watch. "Who else has elevated the cause of the Palestinian prisoners other than President Mahmoud Abbas?" asked Deputy Minister of Prisoners' Affairs Ziyad Abu Ein, in a 2014 interview on Official PA TV, adding that "all the laws, the tenfold increase of the budget of the Ministry of Prisoners' [Affairs] - [all this] was done during the tenure of Palestinian President Mahmoud Abbas and according to the wishes of Palestinian President Mahmoud Abbas..."
That year, the Palestine Liberation Organization (PLO) assumed responsibility for paying terrorist prisoners in an effort to mask PA's involvements. Longer prison sentences lead to more money for terrorists' families, which further encourage future generations to engage in terrorism. Abbas previously acknowledged that the PA "ordered" Palestinians to engage in terrorism during the Second Intifada, in an effort to justify payments to convicted terrorists and secure their eventual release. "This is war. One [Israel] ordered a soldier to kill, and I ordered my son, brother, or others, to carry out the duty of resistance (Palestinian term referring to violence). This person killed and the other person killed," Abbas admitted in a 2005 interview on official PA TV and translated by PMW. Abbas may claim that Palestinians are raising youth in a "culture of peace," but overwhelming evidence shows that the PA and other Palestinian factions systematically promote violence against Jews and Israelis. In March, Abbas met with Palestinians who conducted attacks during the most recent Palestinian terror campaign, including a 14-year-old who tried to stab Israeli civilians in September. Abbas' incitement in September 2015 helped spark a wave of violence against Israelis when he called for Palestinians to prevent Jews from entering Al-Aqsa mosque with "everything in our power." "The Al-Aqsa [Mosque] is ours... and they have no right to defile it with their filthy feet. We will not allow them to, and we will do everything in our power to protect Jerusalem...Every martyr (Shahid) will reach Paradise, and everyone wounded will be rewarded by Allah," Abbas said in a speech, segments of which were aired on official PA TV and posted on his website.